A philosophy graduate interested in critical theory, politics and art. Alias of Jelena Martinović. Christie’s has just unveiled a blockbuster consignment for the fall auction season that may set a new record for a work by a living artist. David Hockney‘s Portrait of an Artist (Pool with Two Figures) from 1972 will be offered at the house’s November evening sale o postwar art in New York with an estimate “in the region of $80 million.” The acclaimed work might become the most valuable work of art by a living artist sold at auction. One of the most iconic images in the artist’s oeuvre, the painting is a story of two compositions. The first was inspired by the serendipitous juxtaposition of two photographs on the artist’s studio floor – one showing a distorted figure swimming underwater and the other boy gazing at something on the ground. The initial work, started in 1971, was ultimately destroyed by the artist after month os working and reworking, but the artist began working on another version in 1972 ahead of a planned exhibition at New York’s André Emmerich Gallery, which was due to open just four weeks later. The artist staged hundreds of poolside photographs following his original composition, along with a selection of photographs of his former lover, Peter Schlesinger wearing the same pink jacket in Kensington Gardens, taking cues from this assemblage to create the painting. 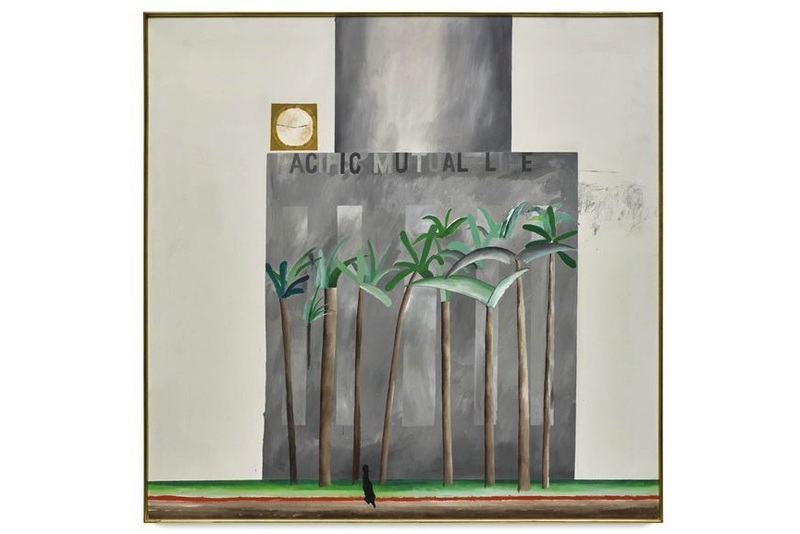 Reportedly owned by Joe Lewis, the Bahamas-based billionaire and owner of Tottenham Hotspur, the painting would be nearly three times the price of the most expensive Hockney sold at auction to date – Pacific Coast Highway and Santa Monica from 1990 which was sold for $25,000,000. Before its sale in New York in November, the work will be exhibited in Hong Kong on September 28-29th, London on October 3-5th and Los Angeles on October 23-17th. 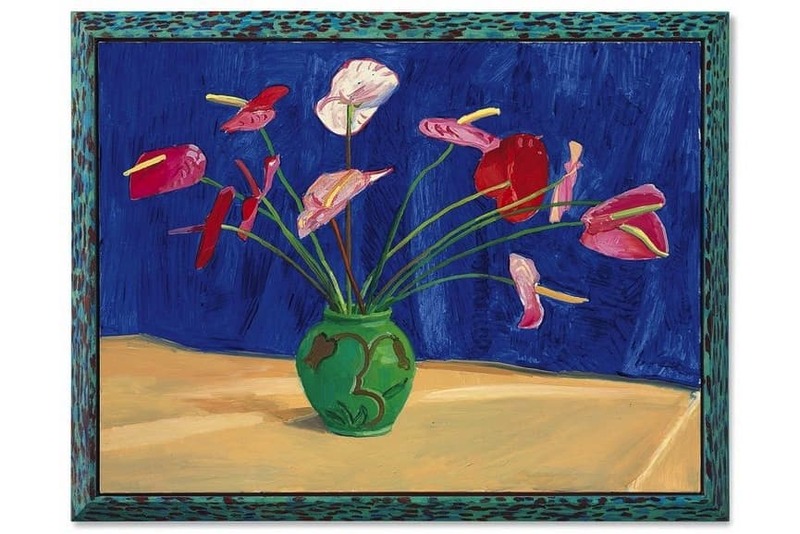 Ahead of this sale, let’s take a look at the ten most expensive works created by David Hockney! Featured image: David Hockney – California Bank (detail), 1964. 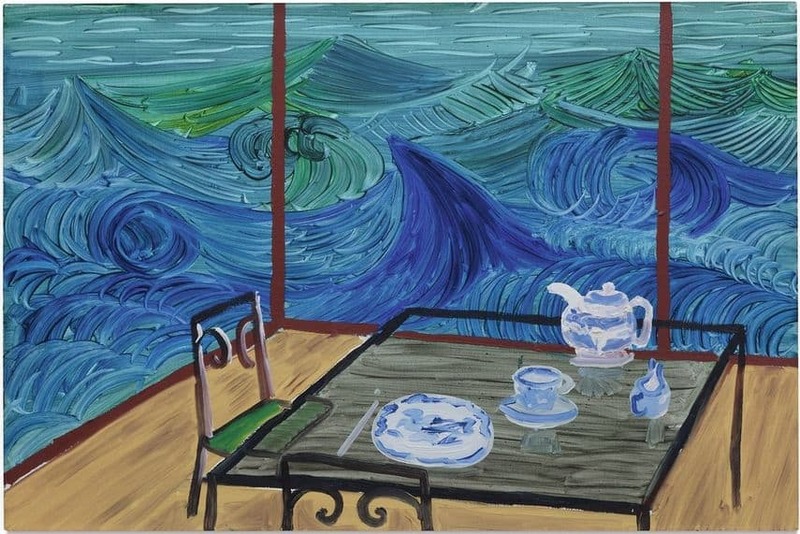 Created in 1989, the year following Hockney’s move from Hollywood Hills to his beach house in Malibu, the work Breakfast At Malibu, Wednesday is painted in the arresting palette of bold blues, greens and aquamarines. It is characterized by a complex composition, the rich, saturated color application and deft handling of space, like many of the artist’s greatest paintings. Hockney was much inspired by natural splendor and distinctive topography of coastal Malibu, which spurred his re-imagining of landscape painting. The work sold at Sotheby’s New York on November 16th, 2017 during their Contemporary Art Evening Auction for the hammer price of $3,950,000, even though the high estimate was $1,800,000. Click here for more auction data! Among the very earliest works painted by David Hockney during his first visit to California in 1964, the work California Bank from 1964 encapsulates the unmistakable West Coast spirit. It shows the artist’s keen formalist concerns with illusionistic space and a wry critical engagement with the modernist abstraction and Minimalism of the era. There is a distinctly Californian palm tree in front of the building and a trio of dark green bushes. While the central palm is painted with delicate naturalism, other foliage is depicted in flat three-dimensional organic shapes. It stands among Hockney’s most ingenious deconstructions of the picture plane. The work was sold at Christie’s London on March 6th, 2018 during their Post-War and Contemporary Art Evening Auction for $3,982,137. The work Antheriums from 1995 marks Hockney’s triumphant return to painting, after he spent a decade behind the camera lens. The artist started painting flowers as a way to channel his emotion in the wake of a string of his friends’ deaths. Triumphantly theatrical, the painting depicts the pink, white and red titular antheriums in a sparsely decorated green vase, sprouting their upright yellow blooms in all directions. The vase and flowers assume the role of an actor on stage, referencing the artist’s ongoing fascination with the theater. The work was sold at Christie’s New York on May 17th, 2018 during their Post-War and Contemporary Art Evening Sale for $4,700,000, surpassing its high estimate of $3,500,000. 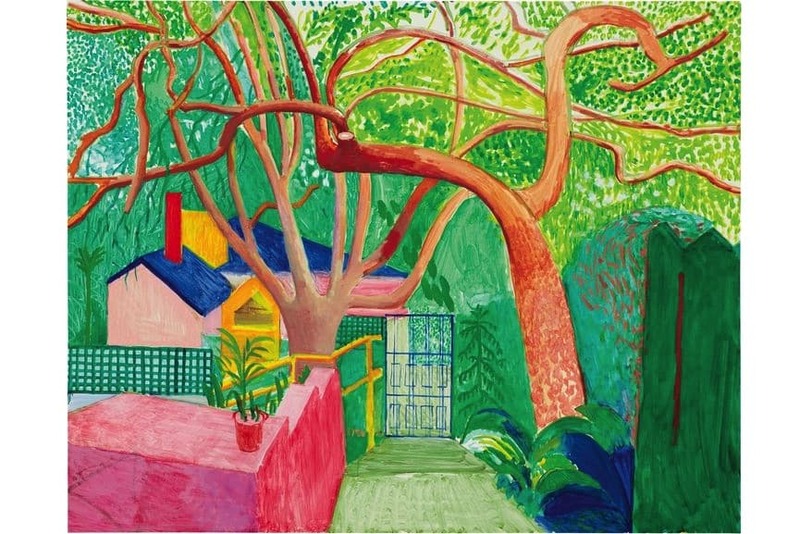 Executed in Hockney’s characteristic high-keyed palette, the work The Gate from 2000 shows a stunning domestic landscape, alluding to his own history as well as his artistic predecessors. The work embodies his varied influences and interests, ranging from stage-set design to photography, digital media to Old Master painting, Los Angeles to London. Focusing his art on how to relate what he sees and how he sees it to the viewer, Hockney imbued his scene with a particular sense of experiential sharing. The work was sold at Phillips New York on November 16th, 2018 during their 20th Century & Contemporary Art Evening Sale for $6,000,000. 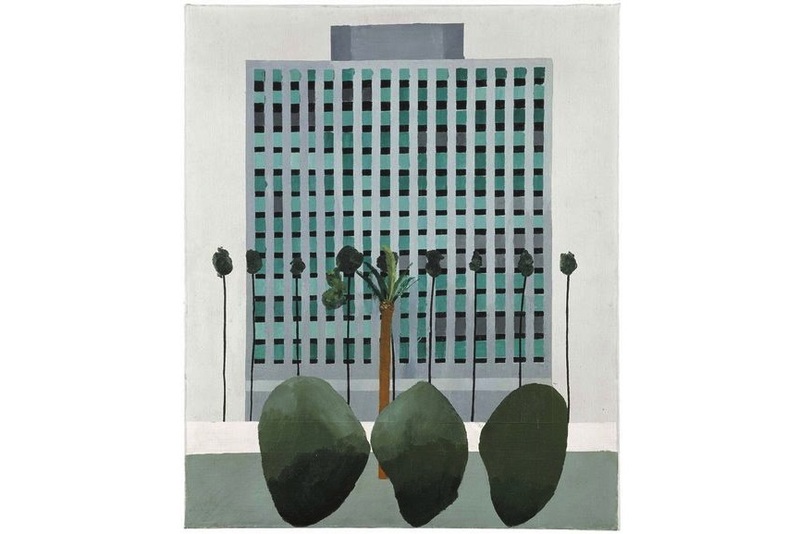 The work Building, Pershing Square, Los Angeles from 1964 is another work from Hockney’s era-defining painted visions of Los Angeles. Among the first paintings the artist created upon his arrival, it shows his earliest impressions of the city. The topography of a specific city square in downtown L.A. is reduced to pure form, accompanied by sensuously sprouting palm trees. 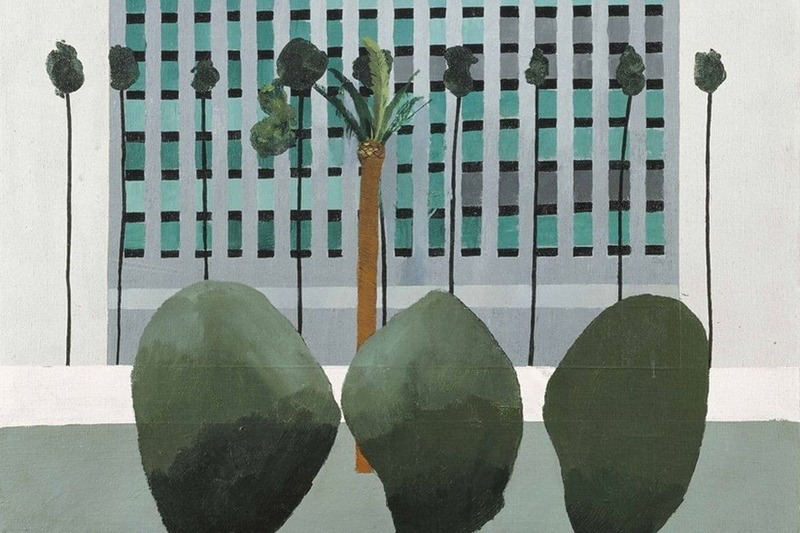 It belongs to a rare and exclusive group of paintings of commercial and public buildings in Southern California that Hockney executed in the years between 1964-1966. The work was sold by Sotheby’s New York on May 18th, 2018 during their Contemporary Art Evening Auction for $6,800,000. 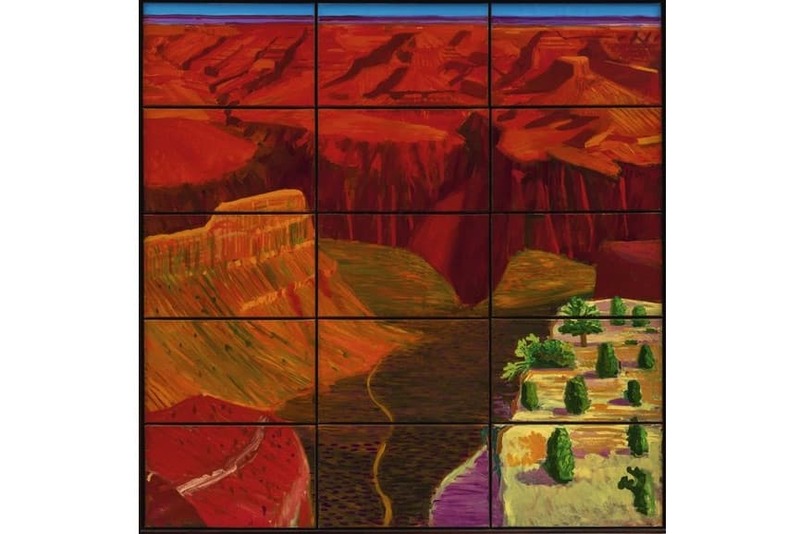 15 Canvas Study Of The Grand Canyon from 1998 presents David Hockney’s vision of the Grand Canyon steeped in his knowledge of art history and the significance of this site as a cornerstone of the American cultural consciousness. The enormity of the landscape is suggested by a high horizon line, while a palette of fierce reds, oranges, and purples are chosen to evoke a very direct sense of place. 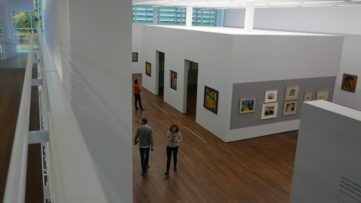 The work revolves around the perspective of the spectator who stands in the center of the composition, aiming to convey the experience of space. The work was sold by Sotheby’s London on October 5th, 2017 during their Contemporary Art Evening Auction for $7,058,979. The work Piscine De Medianoche (Paper Pool 30) from 1972 is a brilliant iteration of the artist’s beloved series – the Paper Pools of 1978. 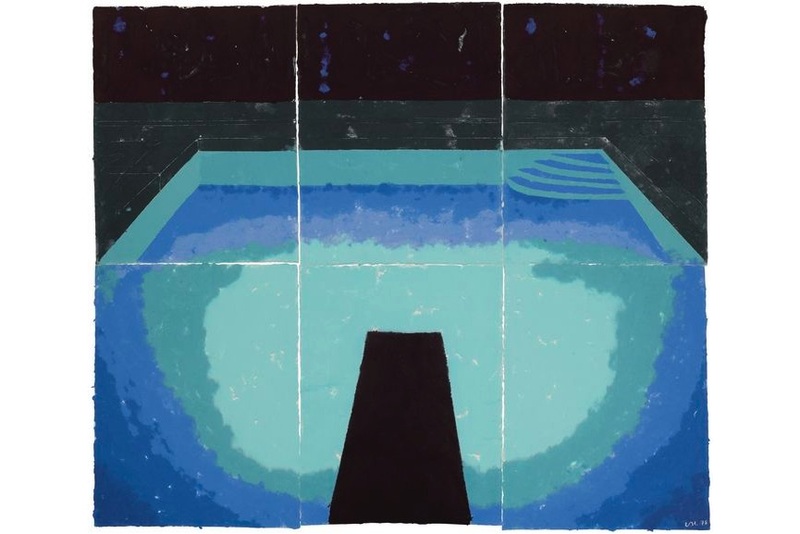 Inspired by his friend Kenneth Tyler’s swimming pool in Westchester County, it depicts a swimming pool after dark. Taken from the vantage point of the diving board after nightfall, the pool is painted with the intensity of the saturated colors of turquoise and aquamarine, extending outward in concentric rings from cool, crystalline waters to a shadowy marine blue. The entire series captured the particular essence of Southern California in the mid-1960s, epitomizing the era of unabashed optimism. The work was sold by Sotheby’s New York on May 16th, 2018 during their Contemporary Art Evening Auction for $10,200,000, even though the high estimate was $7,000,000. 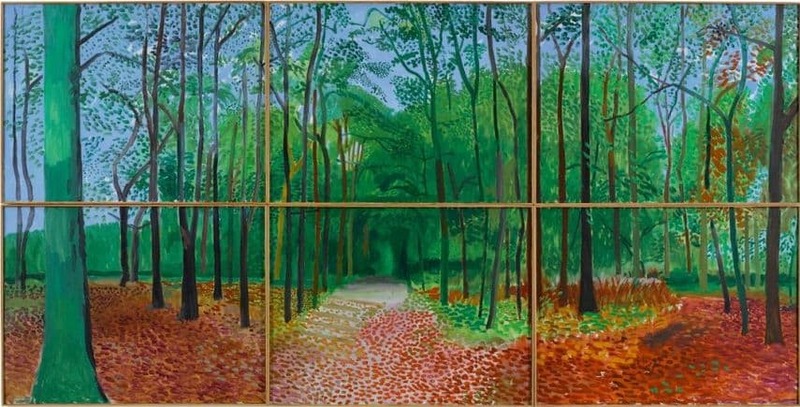 In the work Woldgate Woods 24 25 And 26 October 2006, Hockney transforms the bucolic North of England into an Edenic panorama of chromatic wonder that radiates with pure ebullience. Rising from a ground covered in golden amber leaves, Hockney’s richly painted trees erupt with lush green foliage beneath a crisp blue sky. Reflecting the artist at the very height of his artistic confidence, it belongs to a group of nine monumental six-panel paintings of the same vista, depicted in its varied appearance over the course of the changing seasons. The work was sold by Sotheby’s London on June 26th, 2018 during their Contemporary Art Evening Auction for $10,200,000. 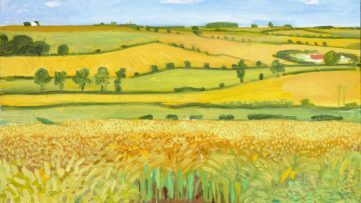 The canvas Double East Yorkshire from 1998 belongs among the very first of Hockney’s Yorkshire landscape pictures. The largest of the size, this work set the tone for an entire decade’s worth of work devoted to the landscape of his home county, in which this work remains one of the most stunning and evocative. It features gently rolling fields painted in the color palette which suggests the abundance of summer fauna and arboreal profusion. This scenery is the reflection of Hockney’s truly emotive connection with the surroundings of the East Riding landscape. The work was sold by Sotheby’s London on June 26th, 2018 during their Contemporary Art Evening Auction for $13,105,680. 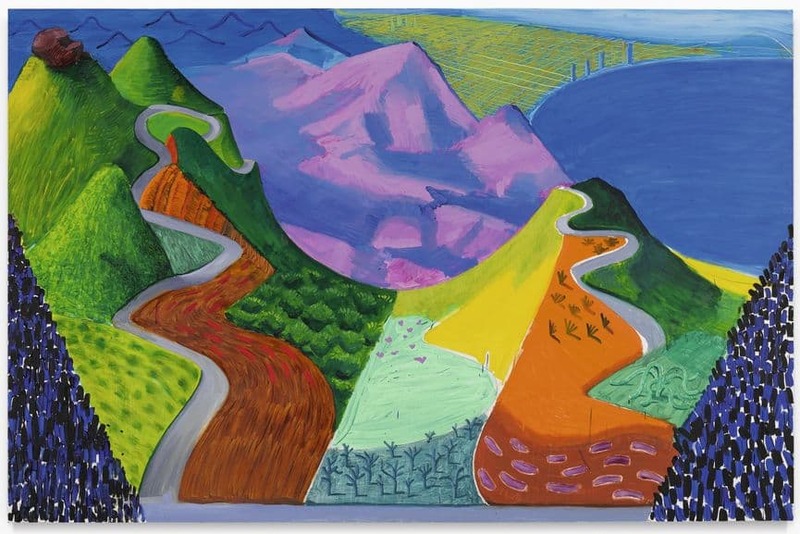 In the work Pacific Coast Highway And Santa Monica from 1990, Hockney brought together sources as disparate as Vincent van Gogh, Pablo Picasso, Chinese scrolls, his own experience designing theater sets, and his ceaseless explorations into new technology. One of the richest and most dynamic paintings from the artist’s career, it presents a natural landscape through the prism of memory and the language of abstraction. Exploding in a riot of chromatic brilliance, the scenery features colliding perspectives coalesce in an energetic and lively juxtaposition of viewpoints. It beautifully showcases the luminosity and color of the California landscape. The work was sold by Sotheby’s London on June 26th, 2018 during their Contemporary Art Evening Auction for an amazing $25,000,000, becoming the most expensive Hockney work ever sold.